Today, more than 40 minutes a week is spent grocery shopping, adding up to more than two full days a year that shoppers weave through produce aisles and shiver in the freezer section, according to the Time Use Institute. There are more than 38,000 grocery stores nationwide and JLL’s latest Grocery Tracker explores four trends transforming the grocery sector to help shoppers get food into the fridge. “Time-crunched consumers are changing the way grocers are thinking about their store’s formats and products. 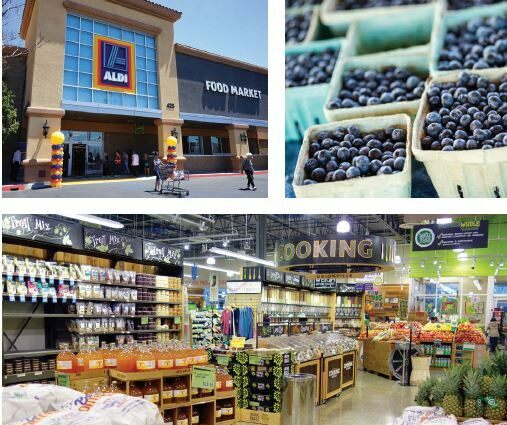 And luckily, grocers small shifts to improve convenience through technology and prepared meals hasn’t compromised quality,” said James Cook, Director of Retail Research, JLL. “In the 1950’s, shoppers would head to the local grocery store once a week to get the staples: milk, bread and eggs, plus all the fixings for the week’s dinners and lunches. Today, the purpose of grocery shopping is the same. The difference is that consumers don’t have the time, or want to spend the time doing this necessary chore,” said Cook. As a result, traditional grocers are becoming grocerants, a restaurant and grocery store hybrid with prepared food sections. Now, if you’re heading home from work and need to get dinner on the table you can stop at your conventional grocer like Mariano’s, H-E-B, Hy-Vee or Kroger and grab a prepared meal. But, traditional grocers aren’t the only ones capitalizing on the heightened convenience kick. Dollar stores, like Dollar General, are getting into the consumables game by upping their product mixes with prepared salads and sandwiches, fresh produce and frozen meals. Have you ever felt like the person in front of you at the grocery store is stocking up for the next year? Well, now grocers are going beyond grab-and-go prepared meals to help you skip the lines too. A global Superstore recently added a new scan-and-go app tallies your total as you shop – just pay at the front. While Kroger’s ClickList, let’s you order-online-pick-up-in-store cutting down on shopping time. 365 by Whole Foods provides a more affordable price by employing less people and using iPads to order food. While you may not see iPads replace people in every grocery store in 2017, expect for more and more grocers to experiment with mobile ordering technologies that link to curbside pickup or deliveries. shopping and grocers are already taking note. When you’re hangry, driving for miles to get to the grocery store isn’t ideal, but luckily more grocery stores are popping up across the United States. In 2016, more than 440 grocery stores opened in the U.S., adding 18.8 million square feet of space. JLL found that 27 percent of new grocery stores opened in Texas and California. By comparison, the next three largest states in terms of new space were North Carolina, Virginia, and New Jersey, which each accounted for just 5 percent of total space delivered in 2016. Aldi and Grocery Outlet dominated California, while Kroger and H-E-B continued their push into the Texas market. Overall, Aldi and Whole Foods were the biggest movers in the sector, opening the most stores by count. Categories: Agency Leasing, Retailers and tagged Grocery, JLL, retail.